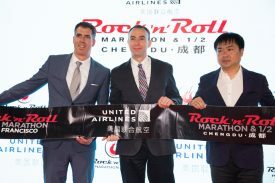 CHENGDU, China – Competitor Group, Inc. (CGI), operators of the Rock ‘n’ Roll Marathon Series, today announced an agreement with United Airlines to create the first Asian event under the Rock ‘n’ Roll Marathon Series umbrella in Chengdu, China. The inaugural China event, the United Airlines Rock ‘n’ Roll Chengdu Marathon & ½ Marathon, is scheduled to take place on Sunday, October 29, 2017. The City of Chengdu is the provincial capital of Sichuan and the 10th largest city in China with over 7 million people. The marathon will start and finish in northwest Chengdu’s Dujiangyan City and expects to attract more than 15,000 runners. The event will be held in conjunction with the Chengdu Sports Bureau, Chengdu Municipal Bureau of Tourism, People’s Government of Dujiangyan and the operators of the Chengdu Panda Marathon, Double Heritage Sports, to compliment CGI’s international marketing expertise. The Rock ‘n’ Roll Marathon Series began in San Diego in 1998. Famous for lining race routes with live bands and entertainment, the series has expanded around the world to include more than 30 events in 2017 with the addition of the Chengdu Marathon. In addition to the sponsorship of Chengdu, United Airlines was recently announced as a new title sponsor of Rock ‘n’ Roll Marathon Series events in Washington DC, San Francisco and Los Angeles. Further information about the Rock ‘n’ Roll Marathon Series can be found online at RunRocknRoll.com. United Airlines and United Express operate more than 4,500 flights a day to 339 airports across five continents. In 2016, United and United Express operated more than 1.6 million flights carrying more than 143 million customers. United is proud to have the world’s most comprehensive route network, including U.S. mainland hubs in Chicago, Denver, Houston, Los Angeles, New York/Newark, San Francisco and Washington, D.C. United operates 737 mainline aircraft and the airline’s United Express partners operate 483 regional aircraft. The airline is a founding member of Star Alliance, which provides service to 192 countries via 28 member airlines. For more information, visit united.com, follow @United on Twitter or connect on Facebook. The common stock of United’s parent, United Continental Holdings, Inc., is traded on the NYSE under the symbol “UAL”. The Rock ‘n’ Roll Marathon Series is famous for lining race routes with live bands and cheerleaders, massive participant numbers and rocking post race concerts. The original Rock ‘n’ Roll Marathon in 1998 is still recognized as the largest inaugural marathon in U.S. history with 19,979 entrants. Over the 20-year history of the series, runners have raised more than $349 million for a variety of charity causes and nonprofit organizations. Today, the series of marathons and half-marathons has spread to 30 destinations around the world. For more information, please visit RunRocknRoll.com or follow @RunRocknRoll on Twitter.